At higher levels, shot rotations for hunters are the single most important way to focus their damage output. Although used less-extensively in PvP, a shot rotation is necessary during any instance or raid to be as effective as possible. Although there were shot rotations before Burning Crusade centered around the cooldowns of Aimed and Multi Shot, these rotations no longer function or are important. Current rotations depend almost exclusively on the level 62 ability Steady Shot. For the entire rest of this article, we will ignore pet damage. From the hunter's personal DPS, about half of it comes from auto shot and about half comes from special attacks, if the hunter is doing a decent job. What is unique to hunter difficulties is that they have to both "cast" their main abilities and work around the timer of their auto attack. Melee classes have strictly instant abilities, and casters have no attack they are using alongside their spells. With the exception of maybe an enhancement shaman, no other class faces the difficulty that hunters do. Steady Shot is the single most important ability hunters have for dealing damage. It has no cooldown and is very mana efficient. However, it comes with one very severe limitation that other hunter shots (besides Aimed Shot) do not -- it has a cast time. The reason this cast time matters is because if you are in the middle of "casting" Steady Shot when your next autoshot should fire, the auto will wait until the steady finishes. In this example, the hunter is firing an auto shot only 2/3 as often as they could be. If auto shot is half of the hunter's damage, losing a third of that is like losing 15% of your total damage! On the other hand, let's suppose a similiar shot speed and the hunter waits to cast steady shot until the next auto shot finishes. In this situation, where the hunter fires auto every 2.1 seconds, they are only getting a steady shot every 2.1 seconds. However, steady shot could be fired as fast as every 1.5 seconds. This time, the hunter is losing damage from their specials, which are also half of their damage. Although the loss isn't quite as bad here -- only about about a quarter of their time firing specials is lost -- that's still over 10% of their damage out the window. Have you ever sat on a bus while it was raining, and watched the two windshield wipers? Unlike a car, bus windshield wipers don't work together. Since they work on two completely separate areas, this is ok. They don't overlap at all. But imagine if your car were like that, and every once in a while one of the wipers would have to wait for the other one, or else they would hit each other from time to time. This is what hunter shot rotations are like. The auto shot and the special attacks have to be used in harmony, or else they will "clobber" each other. There's one very obvious situation where these two cycles -- auto shots and special attacks -- can line up. If you can only ever fire a steady shot (or any other shot because of the Global Cooldown) every 1.5 seconds, can you make it so your auto attacks go off every 1.5 seconds? With the exception of Barrel-Blade Longrifle, all end-game weapons have a shot speed no faster than 2.7 seconds. If you can get enough haste to drop your shot speed down to close to 1.5 seconds, you'll be in good shape. Suppose a hunter uses a Wolfslayer Sniper Rifle or another 2.7 speed weapon. A 15% quiver will speed up his shots to every 2.35 seconds. That's a start. If the hunter specs Beast Mastery, they have access to Serpent's Swiftness, which gives them another 20% haste. Now the hunter with the Wolfslayer has a shot speed of 1.96 seconds. Marksmen and Survivalists are forced into going to a different extreme. The issue with Steady Shot "clobbering" Auto Shot is only an issue with Steady Shot, right? So why not just use a different special attack when it would be about to clobber? The result is that they use a different rotation that involves firing three specials between every two autoshots. However, the middle special attack, which would normally block out the second autoshot, is either Arcane Shot or Multi Shot to avoid that happening. Steady Shot is the obvious important ability in each of these rotations. The 1.5 sec cast time drastically affects the performance of rotations. It should be noted that Steady Shot is also affected by haste, so many of the numbers quoted in the article are actually slightly inaccurate. For example, an ideal attack speed might be less than 1.8, since Steady Shot can theoretically be used faster than every 1.5 seconds with haste. Arcane Shot is a lovely ability for quick damage. However, it uses more mana. If the hunter cannot support higher mana usage, they should probably try to avoid using Arcane Shot. Multi Shot rank 1 serves a similiar function, and costs as much as a Steady Shot. Beast Masters will be using Kill Command between shots, which consumes additional mana. Users of the 1:1.5 rotation have no choice but to use Arcane Shot, and require more mana for their rotations. Because Arcane Shot bypasses armor, it will typically outdamage other standard shots, so under optimal circumstances a hunter may want to use Arcane Shot anyway. Multi Shot is not truly an instant ability. Although the tooltip says it is, it cannot be shot on the run because there is a hidden wind-up with the attack. After a few tenths of a second, multi shot will fire as long as the hunter remains still. Presumably this was done to prevent Multi from being a kiting skill. However, the side effect is that multi may behave slightly erratically during shot rotations. It still fires once during the 1.5 seconds of global cooldown it triggers, but it may offset or be offset by auto shot slightly. Aimed Shot is never used in current shot rotations. Not only does it fire slowly and not provide remarkable DPS, but it also resets the auto shot timer -- auto will never fire when Aimed is complete, unlike steady shot. It is possible to chain fire Steady Shot. Under the examples given previously, it would seem that auto shot would get clobbered by the second steady shot before finishing, and then a third would fire and a fourth would start, which would again clobber autoshot. Every second steady shot would delay auto shot. And this would be correct. However, due to the changes in version 2.4.2, the impact of doing so is severely diminished. A player can start a steady shot and if it is within the first 0.5 seconds of the auto shot's time to fire, the steady shot will be delayed long enough for auto to go off. Players have come to the realization that deliberately wailing on their character's steady shot key will cause two steady shots to go off for every auto shot that fires. Because of the lopsided release pattern that results from the delaying, very frequently, only one steady is completed before an autoshot fires. As a result, hunters have taken to calling this rotation "3:2", even though the actual ratio of steady to auto can often be 4:3 or even 2:1. Effective use of the 3:2 rotation requires both a high amount of haste and a slow-firing weapon. The haste requirement means that it is almost exclusively used by beast masters. However, it provides an alternative for weapons that are slower than the previously-ideal 2.7, since a majority of endgame weapons stray closer to 3.0. 3:2 has a higher mana consumption rate than 1:1, and is simpler to perform. Most significantly, there is no upper bound on the amount of haste a player can make use of with the 3:2. As a result, for comparable weapons, the 3:2 actually deals more damage. Both rotations are superior for beast masters than 1:1.5, however without the sort of raw speed that is available via Serpent's Swiftness, marksmanship and survival hunters are usually forced into using the 1:1.5 with a slow weapon. If they find themselves using a fast weapon, they may be able to stack enough haste to make use of one of the other two rotations. Reading the preceding section, it should be apparent that weapon speed is rather significant to the choice of a rotation. With little exception, weapon speeds on ranged weapons will range from 2.7 to 3.0 seconds. A 1:1 or 1:1.5 rotation seeks a particular shot speed after all haste effects are considered. By contrast, a 3:2 rotation wants a certain ratio of the speed of their steady shot to their auto shot, so they only care about the initial weapon speed. In general, you want a weapon as slow as it can be and not affect performance, because if autoshot will go off in your rotation every 2.0 seconds regardless, a weapon that would (ultimately) fire every 2.0 seconds hits harder than one that would have a shot speed of 1.5 if it weren't being clobbered. Except for the 1:1 rotation, slower weapons are almost always preferred, especially since haste rating has become a more popular attribute on equipment and is worthless to a fast weapon. For purposes of considering rotations, there are two types of haste -- passive and activated. Passive haste is a bonus that is always present, such as Serpent's Swiftness, Haste Rating, or the quiver bonus. Activated haste is haste that occurs because of something that happens, whether it is the use of an ability or item like Rapid Fire or Drums of War, or an effect that results from Improved Aspect of the Hawk or Dragonspine Trophy. While activated hastes should not be ignored, passive haste is almost always preferable. If the extra activated haste is beneficial to a rotation, there is the distinct possibility your character is using the wrong rotation, and in fact many players will switch shooting styles as a result of one of these effects triggering. For example, a survival hunter might shift from 1:1.5 into a straight 1:1 after activating Rapid Fire. Some players have worked out an elaborate system for maximizing the use of haste effects to prolong an extended period of hasting. By chaining effects one after another, it maintains the illusion of extra haste, and some players report being able to maintain this for as much as two minutes through the use of Haste Potions, Rapid Fire with Readiness, Drums of War, Berserking, and a group shaman using heroism/bloodlust on command. However, this is a lot of work, and is not sustainable throughout an entire battle. If a player can find the ideal shot speed they desire without using any of these effects, they will have better long-term performance. Although a quiver or ammo pouch will speed up autoshot attacks, it does not affect Steady Shot. The only ability hunters consistently use during a shot rotation besides shots is Kill Command. KC does not use the Global Cooldown, so it is often considered free extra DPS. However, it is usually only mana-efficient for beast masters. Because pet attacks for other specs are not nearly as strong, and mana is on a tighter budget for them, marksmen and survivalists do not always use Kill Command. However, hunters do need to worry about their mana. It is essential for hunters to acquire whatever non-gear regen they are able to, such as mana oils, Blessing of Wisdom, Judgement of Wisdom, Mana Spring Totem, and perhaps a few special items like Mark of Conquest. In addition, having mana potions, especially Fel Mana Potions, is extremely helpful for prolonged encounters. During trash and less crucial fights, a hunter might fall back on Aspect of the Viper, however using this during a boss fight is heavily frowned upon since it prevents the hunter from getting the AP bonus from Aspect of the Hawk. This is not to say, of course, that AotV should never be used. 1:1.5 rotations use considerably more mana due to the inclusion of arcane shot. 1:1 and 3:2 are about the same, with a slightly higher mana output for 3:2. However, this is a great benefit to beast masters. Survivalists benefit greatly from the talent Thrill of the Hunt, which can reduce their mana consumption by over 15%. Paired with the low-end marks talent Efficiency, survival hunters have much less to worry about than marksmanship, although they are both using a much more mana-spendy rotation. Marksmanship hunters have to work much harder to maintain their mana pool, and often intellect becomes a defining attribute for them because of it. When mana is plentiful, such as being grouped with a shadow priest, a beast master might take to using arcane shot or other specs might also include Kill Command. This is a situation to strive for, but depending on reluctance on using consumables, it might not always be possible. Before Burning Crusade, Aimed Shot behaved very similiarly to the way Steady Shot does now. It fired more slowly, however, and as a result the auto shot cooldown was essentially always ready when Aimed completed. Although Aimed Shot cost considerably more mana, it was about the only way hunters could reliably increase their DPS. With enough mana to spare, hunters would often include Multi Shot as well, but because at the time Aimed Shot took 3 seconds to cast and then 6 to cooldown, many hunters operated on the so-called 9 second cycle. That is, they fired Aimed Shot as soon as it was ready and their autoshot had completed. Multi Shot had a 10 second cooldown, so if it was used, it took lower priority to Aimed Shot. Some hunters had a weapon more conducive to using Aimed and Multi back-to-back in a cycle that took 10 seconds. After firing Aimed and Multi the moment it completed, they would have 9 seconds of not using abilities, which allowed the Five Second Rule to disable and get some very brief ticks of mana from their spirit. Although this 10 second cycle was slightly lower DPS, it was higher mana efficiency overall. Many players considered this moot since Feign Death removed the hunter from combat, which let them drink. Weapon speed played a MAJOR role in the old hunter shot rotations. Aimed Shot and Multi Shot were affected by standard autoshot damage, meaning they dealt damage based mostly on (attack power * weapon delay) -- simply by increasing your weapon speed from 2.2 to 3.3, you could increase your damage output on these skills by 50%. Although this was negated by normalization changes in version 1.9, this did not change the fact that weapon speed was still hypercrucial. While charging Aimed Shot, the hunter's autoshot cooldown would be ready to fire afterwards regardless of the speed of the weapon. The slowest ranged weapon in the game, Ashjre'thul, Crossbow of Smiting, was considered ungodly better than any other alternatives because of its high single-shot damage output and synergy with the 9 second cycle. With any faster weapons, Aimed Shot partially clobbered autoshot, and DPS was directly lost in that fashion as well. There was simply no weapon better than Ashjre'thul, and nothing Blizzard could do to make later weapons more appealing would satisfy that unless they were also an identical 3.4 weapon speed. Hunter theorists realized that 3.4 was essentially the perfect speed, (even if slower weapons were made,) and no other existing weapon came close to this. Two 3.3-speed weapons dropped in 5-man dungeons, and were considered the most acceptable alternatives even though they were blues. Since Ashjre'thul was from the second-to-last boss of a raid dungeon, at a less than 1-in-14 drop rate, it was highly coveted and irreplacable, even by the so-called class epic, Rhok'delar, or by any later drops from more challenging dungeons like Nerubian Slavemaker. When Burning Crusade was released, Blizzard realized that the Aimed Shot mechanic was neither a particularly fun way to play the game -- staring constantly at a cooldown timer -- nor was it very fair in PvP. Hunters could very often 3-shot players with Aimed-Auto-Multi very rapidly. Despite significant increases to current player health totals, this burst combo was largely disabled. Not only was Aimed Shot increased from 3.0 seconds to 3.5, but it also reset the autoshot timer. This made Aimed Shot completely unviable as anything other than maybe an opening shot to a fight. Ironically, hunters that were happy with their prayers toward boring fight mechanics and weapons actually being upgradable from one god weapon they would not replace, and acquire well before the end of pre-BC raiding. 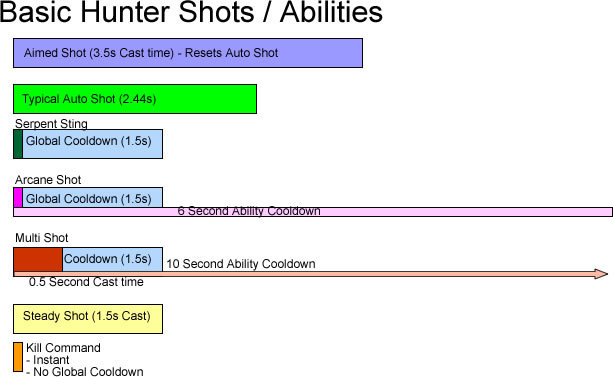 However, to make up for the damage they took away from hunters, Blizzard decided to implement the same exact mechanic into the new BC skill Steady Shot, foolishly believing that a 1.5 second cast time on an ability that did not deal (often) triple the damage of autoshot would be acceptable and not create weapon speed issues. Although Steady Shot was successful in creating its other intended effects -- reducing hunter burst, and making the class somewhat more interactive to play -- it has also made one talent spec exceptionally dominant due to the way ranged weapons are itemized within a very strict speed range, and arguably reduced hunters to mostly pushing a single macro for an entire night without a great deal of consideration for circumstances. ^ Note: The creator of these pictures, lythyrdskynyrd, has a slightly unusual picture for Multi Shot because of the way the shot behaves. See behavior of shots. ^ Unfortunately no pictures exist for the newer rotation. lythyrdskynyrd's pictures were created in mid-2007, and 2.4.2 was released during April 2008. Perhaps someone could create one to illustrate? ^ Except, of course, if they have to give us other stats to do it. If getting some haste rating means sacrificing some agility, perhaps it is not the best decision, and using some activated effects will work out better. ^ This trick no longer works during boss fights, thanks in part to combat pulse. ^ It has also created a situation where leveling hunters do not actually know the proper way to play their class at higher levels because they do not have their most class-defining combat ability until level 62. This page last modified 2008-06-20 13:24:02.